Knowing when your deck needs to be repaired is a critical aspect of home upkeep. After the wear and tear of the winter, spring and fall your deck may be noticeably in need of attention. Having to withstand the elements throughout the year can leave homeowners with big decisions to make once the summertime comes around. You can easily tell how much work the deck needs by thoroughly inspecting key parts of it, once the weather clears up. After determining whether or not your deck needs to be repaired, remember the experts at O’Leary & Sons are more than happy to help. Below are some tips to keep in mind when inspecting your deck to see if further repair is necessary. The buildup of stains and blemishes are often caused by daily usage of the deck. Stains that aren’t removed can quickly start to eat away at the protective sealant. Once this process starts, it results in additional peeling away of the protective surface. Eventually the wood will become exposed to moisture which ultimately leads to rotting. Often times, smaller stains can be quickly removed with water and a mild detergent. For tougher stains, it simply takes a solution of mineral solvents being rubbed lightly on the surface with a soft brush. Once the stains have been properly cleaned, it’s important to rinse the deck thoroughly. Stains and blemishes are the first sign that a deck may need repair. If the stains remain small, it can be easy enough to remove them on your own. Larger stains may require further action. Finding loose screws or nails in a deck before they hurt you or someone else in your home is best case scenario for a deck that’s clearly in need of repair. Loose fixtures within your deck is a great way to tell if the deck needs to be repaired. Homeowners are advised to inspect the deck closely, and to refrain from using the deck if loose nails are found. If loose nails are found, it’s advised that homeowners make plans to for repair immediately. In the meantime, the loose nails in the deck can be removed using a claw hammer. If you find that there are loose screws or nails in your deck, don’t hesitate to reach out to O’Leary and Sons to schedule a repair today. Often enough, the wooden boards that your deck is made out of eventually becomes damaged which means a replacement is necessary. Usually, the cause of the withered boards is basic wear and tear. This sort of damage typically occurs most often in high traffic areas. If you can easily find splits in the wooden boards, keep in mind that these are the pieces most susceptible to breaking. 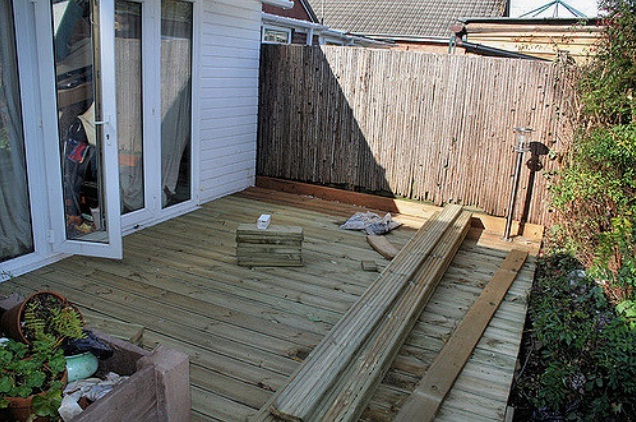 There’s a high probability that someone could hurt themselves or do further damage to the deck when broken boards aren’t immediately rectified. Replacing the broken boards with new ones is typically a quick process. If you’ve taken a good, hard look at your deck and determined that it could use a fixer-upper, reach out to OLeary and Sons at your earliest convenience. With the summer months fast approaching, you don’t want to wait much longer to have a reputable Colorado Springs deck refinisher to inspect or repair your deck. For more info, contact O’Leary and Sons today!